Easy. Provide support or plant against structure. May be short lived but reseeds readily. This is the old fashioned flower that we so often associate with farm yards and Grandma's garden. 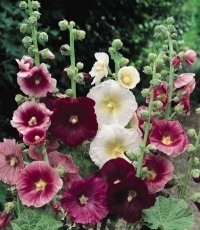 Hollyhocks are stately plants reaching as high as six feet. They flower mid- to late summer in shades of pink, red, yellow, and white. Because of their height, Hollyhocks are best placed against a fence or building to provide support and protection from the wind. They should receive full sun at least a part of the day. Despite the fact that they are often seen grown in waste places. Hollyhocks actually prefer a moderately rich soil that does not dry out severely. While they are very tolerant of less than optimum conditions, the results are no where near as spectacular. New plants should be spaced 12 to 18 inches apart. Hollyhocks tend to be rather short lived so division is rarely necessary. They are prolific self sowers though, so a continued supply can be ensured by allowing a few seedlings to develop each year. This means that a few of the somewhat unsightly flower stalks must be left for seed formation.